For those who grew up in cooler climates, there’s a good chance their hockey careers began with a time-honored tradition. That, of course, is skating on frozen ponds. Kurt and Nancy Marhoff were well acquainted with the traditions of a hockey mecca; Kurt is from Detroit, and Nancy originally from Toronto. With backgrounds like that, it was almost a foregone conclusion that their children would end up in hockey. 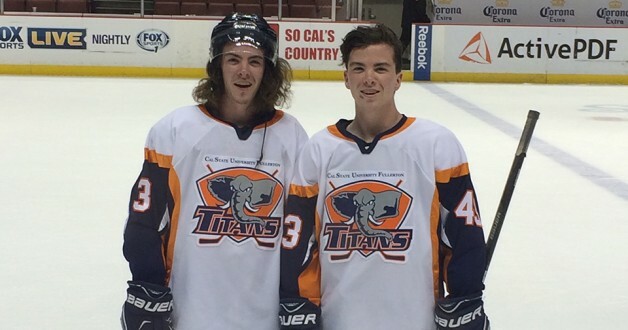 They would have twins – Grant and Chase – and the two both picked up hockey. The kicker? Grant and Chase didn’t learn the game on a frozen pond; in fact, ice wasn’t involved at all. Growing up in Norco, the deficit of ice time might not be that surprising, but playing on a home-built roller rink? That’s another story. Kurt took matters into his own hands in giving his kids their start. As an asphalt contractor, he used his resources to acquire the necessary tools to build a rink right in their backyard. In a matter of months, the Marhoffs’ home would be filled with the sounds of youthful exuberance – a melody of sticks and wheels scratching into the rink’s surface. The Marhoff twins were inseparable from that point. They spent night and day practicing drop passes and developing a connection that would become second nature as they rose through the ranks. In high school, they helped lift Orange Lutheran to a USA Hockey National Championships berth their senior year. At the time, Grant played forward, while Chase manned the blue line. The Marhoffs, 19, are now sophomores at Cal State Fullerton. The commonalities continue, as both are business majors. But that wouldn’t be the end of it; they got even closer when they joined the school’s American Collegiate Hockey Association Division II team. Chase moved to forward, and the brothers were placed on the same line. The chemistry was instantaneous. That was on display in the Titans’ two-game sweep of rival Long Beach State in November. The twins were a constant threat on the forecheck, generating countless scoring opportunities. In the home game at East West Ice Palace in Artesia, Chase recovered a dump-in below the goal line and fired a no-look pass into the middle of the ice. The puck landed on the tape for Grant, who deposited it behind 49ers goalie Corey Jones to give the Titans a 4-3, second-period lead. Grant finished the game with two goals and two assists. Team captain Jake Yarter says the duo has been a welcome addition to the club. The twins are only about 5-foot-9, but Yarter noted that the Marhoffs – despite their diminutive stature – play a very big game. “If there’s one thing they make blatantly obvious when they’re out on the ice, it’s that they’re not afraid to go up against anyone,” said Yarter. “At some point, they’re going to lose a couple of battles here and there, but that doesn’t stop them. And for Cal State Fullerton, their efforts are paying serious dividends.